As the federal government makes hundreds of millions of dollars in high-speed rail improvements along the Detroit-to-Chicago corridor, Ann Arbor is putting its own money on the table. 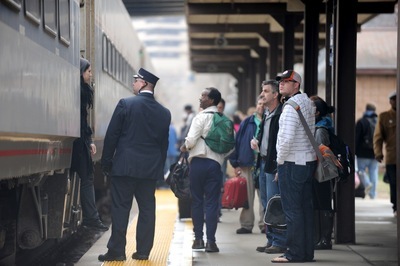 The Ann Arbor City Council decided Oct. 15 to spend another $550,000 from its general fund cash reserves to study options for a new Amtrak station somewhere in the city. That comes on top of $307,781 the city already had included in its current fiscal year budget for the project. The vote was 8-2 with opposition from Jane Lumm and Mike Anglin, who remain skeptical about the need for a new train station. Council Member Stephen Kunselman was absent. The approved resolution stipulates that once the project moves along and more work is done, it eventually will go to a vote of the people before construction occurs. He said the alternative to a train station is more parking structures, more pollution and more congestion on the city’s roads. Eli Cooper, the city’s transportation program manager, presented council members with the latest cost estimates for what’s being dubbed Ann Arbor Station, showing about $31.7 million in short-term construction costs, plus another $11.1 million for a new south rail platform and crossover in a future phase, which Cooper described as “post-2020” when rail volume picks up more. Previous PostAmtrak derailment probe could effect scheduleNext PostMARP meets Nov. 10, 2012 in Essex, ONTARIO!